Given the fact that it is relatively young and less than a century old, it is still not well-known enough by the people. However, art deco architecture has flourished in the given cities as well as in other places of the world. With its ornamental and expressive architectural designs, the Art Deco style was an art form that first took concrete origins in France during the period of the 1920s. From 1905 to 1920, there had been a number of prominent art exhibitions in which several prominent artists and designers had presented the first-ever outputs of the Art Deco style. Back in the turn of the century, France, or specifically Paris, had been a bustling congregation for the finest artistic and literary talents from everywhere else in the world. This meant that Paris was where several artwork festivals and expos were held. In the year 1900, at the Universal Exposition, several artists like Paul Bellot, Emile Decouer and others had launched their new outputs together at the Society Of Decorator Artists. Ever since, the first art decor creations were widely thought of as applied types of arts which meant arts that can be assembled for the purpose of architecture and design. In the 1920s, the art form became really popular. From 1905 to 1920, there had been a number of prominent art exhibitions in which several prominent designers and artists had presented the Art Deco style. The decorative design represented a modern version of the classical arts. The style blended the abstract, almost-psychedelic designs and patterns with an urban symmetry that made the designs look urban yet extremely artistic. However, over the years, the designers have unanimously opined that the artistry form of Art Deco is highly inspired by other existing art forms as well. These include the art forms of cubism and modernism most prominently. There have been a number of fields and areas in which the art form of Art Deco has been used. The biggest example of the art deco designs applications is that of architecture and design of buildings and structures. Other than the buildings, the form of art deco has also been used in other fields like designing automobiles, lightning, furniture, jewelry, dresses and other decoration things. The “Streamline Moderne” art form, which was a version of Art Deco, was extensively used for designing and making vehicles like airplanes. The Art deco designs and templates were also very useful in case of designing simple things like gramophones and even art deco fonts. Many people mix up Art Nouveau and Art Deco, let’s have a look at the similarities and differences. Both trends emerged as reactions to major world events (the Industrial Revolution and World War I) and both embraced modernist elements. The difference: Art Nouveau is more the decorative and playful one, while Art Deco is sleeker, more streamlined with bold shapes, broad curves and zigzag elements. One of the finest exhibits of Art Deco styles in the architecture is in the city of New York in USA. Many of the key buildings of this city have been designed with distinct traces of the stylish Art Deco in them. For instance, the famous Chrysler Building has some fine traces of the Art Deco style in them. On the other hand, Los Angeles has a bigger collection of authentic Art Deco exhibits to be found in its buildings and skyscrapers. The Eastern Columbia Building has an impressive art deco design made of terracotta known as a sunburst design which is a design of the sun’s rays. The Bullocks Wilshire Building also has predominant signs of Art Deco. In Miami a whole area, called Miami ArtDeco District located in South Beach. There is no better way to discover all the beauties as by walking: Take the private Miami Art Deco tour. The Miami ArtDeco District offers a look on up to 800 art deco structures and 10 excellent art deco buildings. Do not miss to take the Official Art Deco District Walking Tour while you visit Miami. London, to begin with, is a good place where some of the art deco designs have survived. However, this is mostly limited to the Underground where there are distinctly Art Deco touches to the tunnels and arches as well as in the stations. More exhibits can be found in other European cities like Valencia in Spain and Berlin in Germany. In Valencia, the buildings are exceptionally artistic and they contain the purest and most unadulterated forms of the original Art Deco designs. 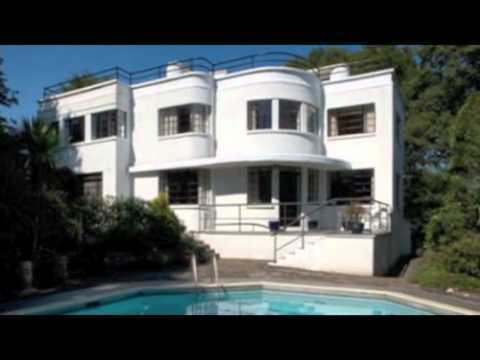 On the other hand, in Berlin and other German cities, the Streamline Moderne style was extensively used in designing buildings and even in the models of big brands like Mercedes. On the Asian continent, Bombay in India, also called today as Mumbai, is incredibly the second city in the world with the most Art deco design in its iconic structures, after Miami. The southern part of the city offers tourists an extraordinary and well-preserved exhibit of Art deco constructions. For instance, key buildings like the Eros Theater and the apartments and hotels bordering the Marine Drive are known for their extraordinary Art deco styles. On the other hand, other areas like Crawford Market and Colaba are rich deposits of several grand architectural designs. Most notably, the New India Assurance Building is known for its designs of Greek statues embedded on walls. Follow us for more ideas and inspiration to help you create your very own interpretation of Art Deco interior design at home. Tagged Architectural Style, Art Deco, Berlin, Bombay, Deco Design, London, Los Angeles, Miami, New York, Paris, Valencia.